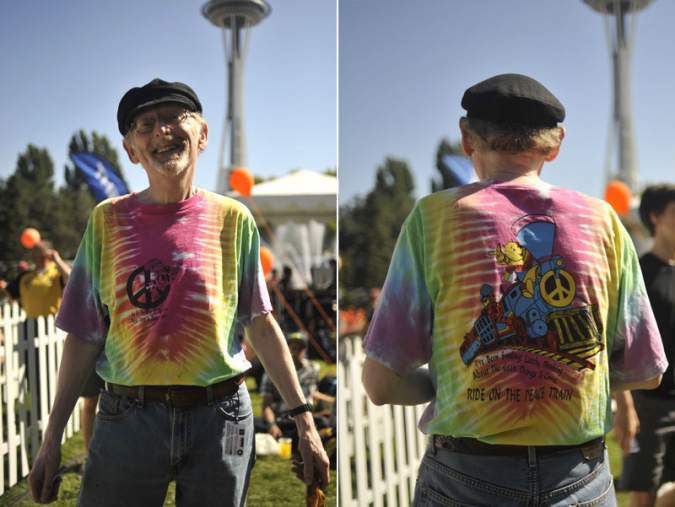 The Bumbershoot music festival has been a vibrant cultural happening in Seattle, Washington since 1971. Thousands of Seattleites and visitors gather at Seattle Center to celebrate during the festival named after the British word for umbrella (why is that you ask?) to steep themselves in the arts, including music, visual arts, dance, comedy, spoken and printed word, film, and theater. Children are definitely welcome to participate, and they happily embrace fun craft-making opportunities at the fest. 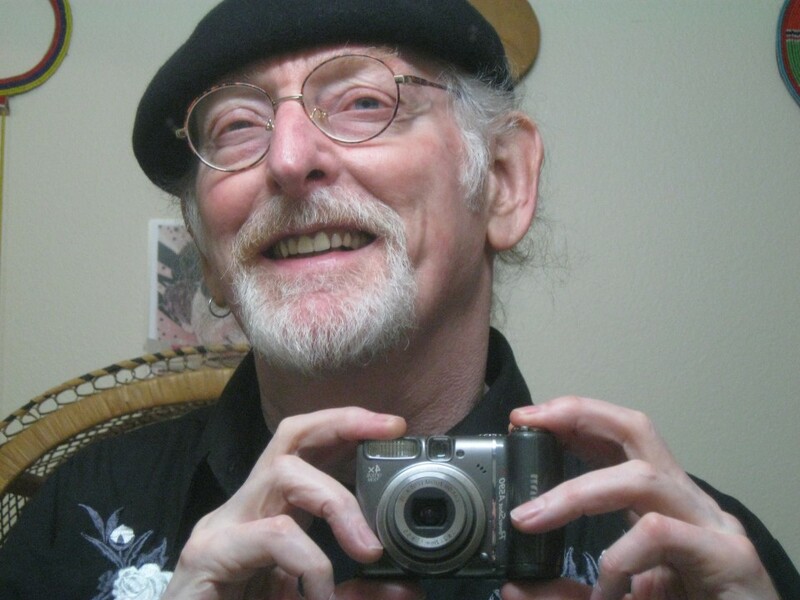 Author, at Bumbershoot, 2012, courtesy Seattle Weekly. 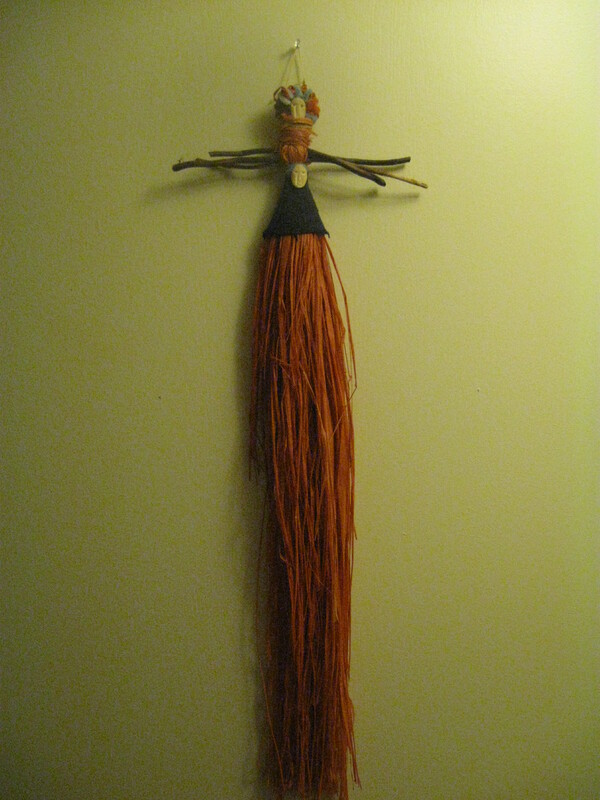 During the early 2000’s, I remember one activity that was particularly popular: the making of “Spirit Dolls”. Circa 2002, I recall a large area was set aside for children to try their hand at this activity. I don’t remember if there was a cost (probably not); but children 10 and under could and still can, get into Bumbershoot for free, if accompanied by an adult, so the event itself has always been a great deal for “Youngershoot” attendees. When the opportunity to make something as fabulous as a Spirit Doll presented itself, Bumberkids made a beeline for that activity, and many Spirit Dolls were made. In fact, in 2002, there seemed to be a surplus of the handicrafts. I saw about a dozen Spirit Dolls attached to the fence which surrounded the sound booth at the awesomely beautiful Mural Amphitheater Stage, which were apparently left behind by their makers. Throughout the three days of the (totally great) festival, I caught several acts at the Mural stage, and I kept my eye on the Spirit Dolls. On Day Three, near the very end of the event, I approached the fellow working the sound booth to ask if I could have one of the dolls. Well, he was happy to let me choose one. I picked out the one which I thought stood head(s) and shoulders above the rest. It is depicted in this post, for your edification. The Bumbershoot fest provided materials and teachers to help kids make their projects. 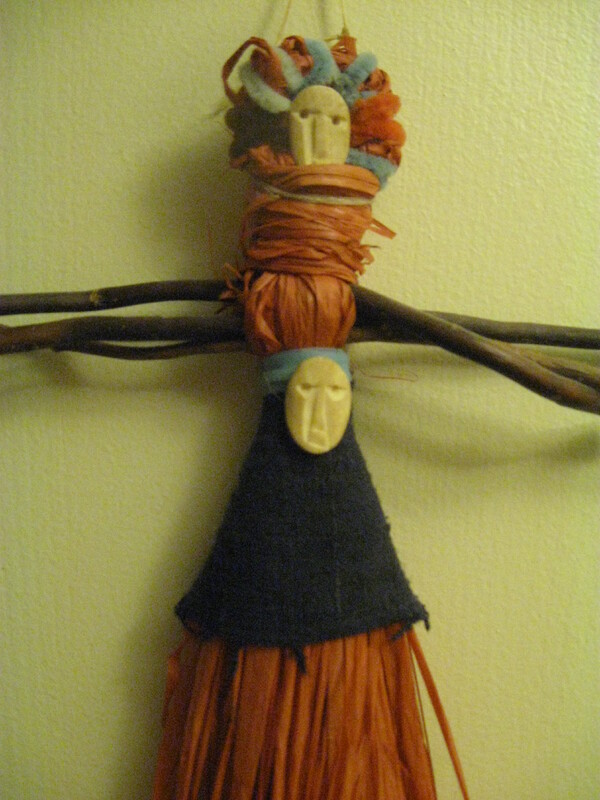 For Spirit Dolls, raffia, sticks, glue, carved bone faces, pipe cleaners and cloth was offered. Grownups or young adults were available to help children make their own doll. 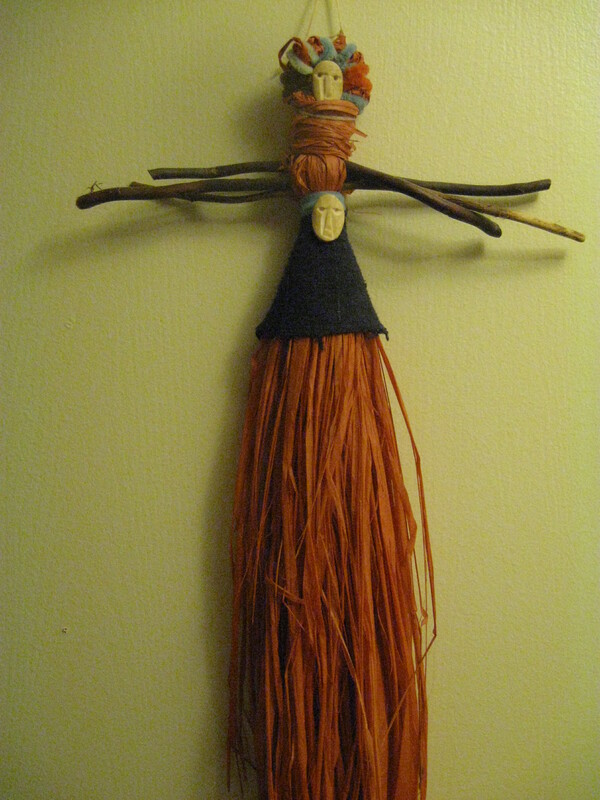 Something tells me the child who made this Spirit Doll didn’t need much help. This is an example of how something fantastic can be made from not-so-expensive materials, when the right person is doing the making. Sometimes I have to remind myself that this is a child’s craft project. There’s not a lot of childish whimsy apparent here! Obviously, what stands out the most about this doll is that its maker gave it two faces! I viewed many Spirit Doll images on the interweb in researching the subject, and I found no two-faced ones. Again, the person who made this doll was very creative. — I did see one doll that had an additional face on it, but that was obviously done to represent a mother and her baby. Perhaps “my” artist had the same intent? I have hung this fascinating piece in the succession of homes I’ve lived in since 2002. One of the most challenging moments I have when mounting art in my new digs is finding just the right place for the Spirit Doll. Anyone can go to a folk art gallery and locate an object which speaks to them and carries meaning for them. And hopefully they’ll have the funds to acquire it. But there are occasions where the piece just comes to them, for free. 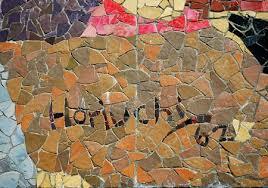 Art made by people under a certain age is often labeled “kids’ art”. But really, it’s just art, made by younger artists. I’ve seen so many beautiful/intriguing/amazing works of art made by young people. I try to appreciate it for what it is; I try not to categorize it. I don’t segregate the art in my home according to the age of the person who created it. It’s important to encourage our young artists, and to praise their work. Perhaps a child may not realize how talented he or she is, or how amazing their work can be. Maybe that’s why this Spirit Doll was left behind. I wish I could find the boy or girl who made the doll. They would be a young adult now. I’d offer to return it to them, hoping they would realize just what a great thing they created! I’m not certain why Bumbershoot staff called these dolls Spirit Dolls. 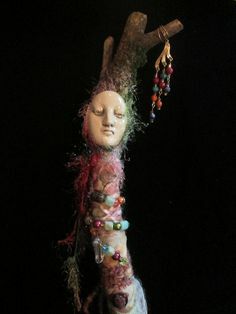 Some adults also make Spirit Dolls (see below), and some believe they are imbued with properties or qualities such as healing or wisdom, or that they honor an ancestor. In other words, there are serious Spirit Dolls being made. But I don’t think Bumbershoot was going in that direction. 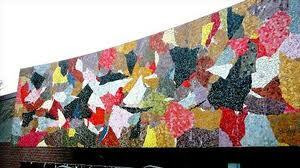 The Mural Amphitheater Stage is named after the beautiful Paul Horiuchi mural, which serves as a wonderful backdrop to music and dance performances at Seattle Center. Created for the 1962 Seattle World’s Fair, it was recently restored to its original beauty.